When the coin cell challenge was posted, my first thought was that there’s no category for “craftsmanship”, “best in show”, “most artistic”, or “surprising use of the cell”. Just longest running, supernova, and heavy lifting. This entry will probably not win because other entries will blink an LED for much longer, but it would be a clear favorite in craftsmanship or “most artistic”. Well of course there’s not, why would there be? Don’t get me wrong. I can appreciate fine craftsmanship and such contests do make sense in a broader competition but this one is about using a coin cell. The defining characteristics of a coin cell are that they are small both in size and capacity. Naturally any competition centering on them will focus on overcoming that limitation. It’s kind of the point! The execution is what really makes this stand out from a lot of novelty led-face watches. It looks super nice. The PCB green matches the bezel and leather band very well. So pretty. Way to pay attention to the details! With 36 led’s what’s the battery life? And with what battery? An old joke goes like this: in a small train station, somewhere in the Eastern Europe in the mid ’80s, there are two passengers waiting for the next train. One of them was seated on his two big and heavy suitcases, the other one was pacing nervously. He was sure he’ll be late and worse, his watch stopped because he forget to wind it. So he builds up his courage and asks the other dude what time is it. The suitcase man rises on his feet and move up his sleeve to reveal a nice large electronic watch, with lots of screens and reply: it’s 3:45 PM, the next train comes in 12 minutes. The nervous guy becomes excited: what are those screens? Well, you have the current time, time in main cities around the world, wake up schedule, electronic calculator, train time table, radio, tv, notepad, reminder and that’s only what i managed to learn since i got it – comes the reply. The first dude continues: so it’s made in America or in Japan? It’s made in our country comes the answer. Impossible – exclaims the first man -, what type of batteries does it use? The man with the watch picks up the two heavy suitcases saying: what do you think i’m carrying out here? Even with 36 LEDs, there are probably only 3 on at a time, one for hours, minutes and one for seconds. not even that most of the time. 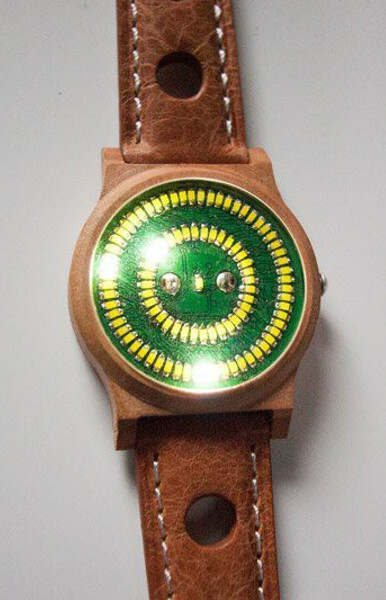 The video shows that it lights up to show the time only for a short duration when you push the button. The software could use multiplexing lighting only one LED at a time at rapid succession making it appear that all three needed LEDs light at the same time. This can help cut power consumption as well as I/O pins needed from the ‘328. Very cool. May be able to greatly increase battery life in dark environments by covering the LED array with glow-in-the-dark paint and using very short LED pulses to recharge the coating. You can’t get something from a transfer without loss. Greatly inefficient. The watch is push to read after all. If going for a more organic look why imitate boring machine roundness. I have always thought a round watch fits the strap the way a round peg fits in a square hole, not very elegant. Some fruit woods are hard but those strap pins will dig out, usually when reaching into or out of something. Been playing around with this, with whatever glow-in-the-dark substance is in the 3D filament that I bought (green-yellow, FWIW). Super-short pulses don’t seem to work very well — it looks like it needs at least 100-200 ms to charge at all. It’s probably better to drive LEDs at ultra-low duty cycles. But not as cool as using glow-in-the-dark. :) Anyone else playing around with this idea, chime in! As echodelta wrote, glow in the dark is inefficient, direct light to eye is better and more adaptable to different enviorment light and you have no problem with “afterglow” making something hard to get a reading of. Its quite important to use low spectrum light for more effective absorbation in the glow material, normal blue leds work for yellow glow in the dark, but lower nm blue-violet is better, especially with greener glow in the dark, and is the reason why whiteleds are bad for charging most glow in the dark, wrong lightspectrum. Then comes the led efficiency to convert current to light. Glow in the dark also need enough “charge light” to accually be usefull, 395nm diodlasers are very handy and can be quite efficient and short pulsed to make it glow a lot. Glow in the dark has its places where its usefull, but theyre limited and dependnig on correct charging and discharging otherwise its useless.